Boris Lvovich Shaposhnik was a legend. BL Shaposhnik is a gifted man, as if born with a counting ruler in his hands." All his decisions were distinguished by thoroughness of the justification, novelty and courage of design. The talent of the designer and the outstanding production organizer allowed Boris Lvovich to quickly advance along the steps of the service ladder. Only a very narrow circle of dedicated people knew why this legendary countryman was awarded such high honors. Almost his whole life passed for an incredibly tight veil of secrecy. Since the beginning of the 1960s of the last century, not a single military parade on Red Square was held without the participation of its mighty machines, which surprised the whole world. But not only until the death of the Designer in 1985, and much later no one could name the creator of these machines. Fame without a name. His contribution to strengthening the defense capability of the USSR can not be overestimated. Thanks to the dedicated work of the Designer, the RVSN could have the unprecedented power of the mobile ground-based missile systems Temp-2S, Pioner, Topol, Speed, Celina, Celina-2, and Courier, which would be an impenetrable shield for any aggressor. The majority of these vehicles became a victim of changes in the course of political games and by results of negotiations. But they fulfilled their task. There were many vehicles from Shaposhnik: the first 25-ton dump truck MAZ-525, and the uniaxial tractor MAZ-529, and the four-axle four-wheel tractor MAZ-535 and MAZ-537, and the chassis MAZ-543, MAZ-547, MAZ-7912, MAZ-7904, MAZ-7917 and many others. It should be noted that the MAZ-543 chassis, created for Temp-C, proved to be very successful - for many years it became the basis for the technology developed by MZKT. After the modernization of the chassis MAZ-543 and its modifications have been used for a number of missile and artillery systems - Elbrus, Pioneer, Rubezh, Bereg, S-300, Smerch and others. Boris Lvovich Shaposhnik was born in 1902 in the Belarusian city of Pinsk on Zavalnaya Street in a large family of a furrier-artisan (before the First World War, Shaposhnikov had three daughters and two sons). He attended an elementary 4-school school, and then a higher 4-class school in Pinsk. As Boris Lvovich himself wrote later, at the incomplete age of 15 years, because of the difficult material situation of the family, he was forced to leave school in order to earn a living in various auxiliary jobs. Boris went early "into the people", from the early childhood having learned the taste of a calloused, self-earned bread. A hard life that did not stint on deprivation tempered character, taught independence, helped make the eighteen-year-old boy an uneasy, but decisive step - to go to study in distant Moscow. The young man was engaged in self-training, and in 1920, "having a great desire to continue his education", went to Moscow and enrolled at the factory faculty at the Mechanical Institute named after MV Lomonosov. Lomonosov, and after his graduation became a student of the best technical university of the country - MVTU named after N.E. Bauman. Since 1929, Shaposhnik has been working at the Moscow Automobile Plant "AMO" (since 1931 - the Plant named after Stalin-ZiS ). Even as a student-graduate student - a plumber-planner of the spring workshop, and in December 1930, after the defense of the diploma, B.L. Shaposhnik in this shop gets a job as a technician. After the reconstruction of the plant, Boris Lvovich - as he was already called - became a design engineer for the design department. Then he consistently held positions: deputy head of the engine and transmission group, the leading designer for engines and gearboxes, the head of the carburetor engine department, the chief of the design department, the acting chief designer (December 1938 - mid-1939), chief designer. The time was difficult. Many prominent ZiS experts were arrested on false charges. But after them there were a lot of unfinished developments, including those for off-road vehicles ZiS-23, ZIS-24, limousine ZiS-101A. Boris Lvovich participated in the development of a three-axle truck ZIS-6, half-tracked ZIS-22, ZIS-33, ZIS-35, gas-cylinder ZiS-30, gas-generating ZIS-13, ZIS-18, ZiS-21, ZIS-41, buses ZIS-8, ZIS-16, ZIS-17, was engaged in the modernization of the famous ZiS-5. Before the war, it was possible to manufacture an industrial batch of ZiS-32 cars, which were a four-wheel drive modification of the ZiS-5 truck. In November 1941, B.L. Shaposhnik, like most employees, is being evacuated to Ulyanovsk, where it becomes the chief designer of the newly organized Ulyanovsk Automobile Plant (UlZIS, the future UAZ) . Here, in the spring of 1942, the production of ZiS-5V trucks was set up. In 1944, the Presidium of the Supreme Soviet of the USSR " honored Shaposhnik with the highest labor award of that time - the Order of the Red Banner of Labor " for the performance of tasks for the production of cars. " By May 1, 1944, at the UAZ, under the leadership of Chief Designer B.L. Shaposhnik built a prototype of a truck ZiS-253 , which was conceived as unified with a promising Moscow cargo model ZiS-150 . After the specialists of NAMI created a more perfect version of the cabin, hood and wings for the new car, the car received the brand of UlZIS-NAMI-253and in this design was exhibited in 1945 at an automobile exhibition in the Moscow park Sokolniki. This car was supposed to be produced at Ulyanovsk, and later at the Novosibirsk Automobile Plant (NAZ), which was started by the joint order of the NAP and the USSR NSS for # 368c / 350c dated September 8, 1945. The director of NAZ was Peter Ilyich Schwarzburg, the first director of UAZ, engineer - Victor Mikhailovich Mishandin. In 1946, the design department of UAZ was transferred to Novosibirsk, and Boris Lvovich Shaposhnik was appointed chief designer of the automobile giant under construction on the banks of the Ob River (the projected capacity is 100,000 cars per year). It is not widely known that in May 1946 Shaposhnik proposed instead of NAZ-253 on NAZ to start the production of a triaxial machine with a carrying capacity of 5-6 tons. In 1947, NAZ commissioned experimental production, transferred from UAZ - first to develop engines, then - cars. While working on a new truck, it was planned to organize the assembly of GAZ-93 dump trucks on the basis of the existing workshops . In the same year, the first experimental cars NAZ-253 and diesel engines were assembled. However, the development of three-cylinder diesel engines was delayed. On September 25, 1948, a decree of the Council of Ministers of the USSR issued a decree that ordered NAZ to disband, pilot production, design department and development for diesel engines to transfer to the Minsk Automobile Plant (MAZ) , and on the former site of the car factory to begin construction of the Novosibirsk Chemical Concentrates Plant. The order of the Minister of Automobile Industry No. 561 of 11/01/1949 instructed "to transfer from the Novosibirsk Automobile Plant the personnel of the department of the chief designer and experimental shop, headed by the chief designer of Comrade Shaposhnik BL to the Minsk Automobile Plant . " Here, Shaposhnik is appointed chief designer - the head of the "design office of the facility" with the task "to develop design documentation, to make and test prototypes, to put on a mass production MAZ-525 dump truck with a load capacity of 25 tons." In a short time, a two-axle MAZ-525 dump truck with a payload capacity of 25 tons was designed in the design bureau of heavy duty dump trucks . Shaposhnika MAZ-525, the release of which began in 1951, was the first Soviet car with power steering and planetary gearboxes built into the hubs of the driving wheels. Since 1958, the production of this car, and then MAZ-530 with a carrying capacity of 40 tons was transferred to the Zhodino Machine Building Plant. Since the release of these cars began its history world-famous Belarusian auto giant BelAZ. September 30, 1953, the order of the director of the Minsk Automobile Plant, as part of the Chief Designer's Department, a design bureau for diesel engines was organized, and in the experimental workshop - laboratories for engines, fuels and oils. The leadership of design and experimental works on diesel construction ordered the order of the chief designer of the object BL. Shaposhnik. The new design bureau has carried out a large amount of work to create and refine the 12-cylinder engine for heavy vehicles. On their level and quality says the fact that the head of the Design Bureau for diesel engines, Deputy Chief Designer G.D. Chernyshev , in 1960 he was appointed chief designer of the Yaroslavl Motor Plant (YaMZ). Order of the director of the Minsk Automobile Plant No. 15 dated July 23, 1994, pursuant to the Resolution of the Council of Ministers of the USSR No. 1258-563 of 25.06.54 "On the improvement and creation of new models of artillery systems and tractors" and the orders of the Minister of the Automobile Industry from 1 and 5 July 1954, MAZ organized a Special Design Bureau No. 1 (SKB-1) for the creation and production of multi-wheeled four-wheel drive heavy-duty tractors intended for various heavy weapons systems. The main designer of the SKB-1 MAZ is assigned to B.L. Shaposhnik. In the years 1955-56. The first experimental machines of the SKB leave the gates of the experimental workshop, incl. rear-engine engineering tractor MAZ-528 (4x4); single axle tractor MAZ-529 (2x2); tractor-tractor MAZ-532 (4x4) with planetary wheel gears and a forward engine and artillery tractor MAZ-535 (8x8). To meet the needs of the army, non-ordinary design solutions were adopted not only in layout, but also in many nodes and systems of these vehicles. For the serial production of products developed by SKB-1 (later - OGK-2) team under the guidance of B.L. Shaposhnik, as part of the Minsk Automobile Plant on March 29, 1959, the production of special wheeled tractors (PSKT) was established. In the same year, the mass production of MAZ-529 was set up by the plant of lifting and transport equipment. CM. Kirov Minytyazhmash USSR in Mogilev (its modern name - the Mogilev Automobile Plant (MoAZ) - the enterprise will receive only March 28, 1966). 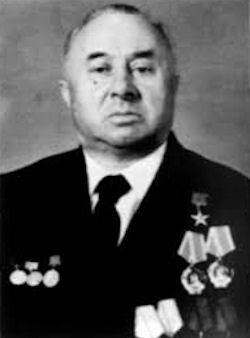 For the creation of new special equipment Boris Shaposhnik in 1959 was awarded the Order of the Badge of Honor, in 1961 - the Order of the Red Banner of Labor. New possibilities allow to create in a short time a universal wheeled truck tractor MAZ-538 (4x4) and a truck tractor MAZ-537 (8x8), the design documentation for which, in 1963, was transferred to the plant "UralSselmash" in the city of Kurgan (renamed in Kurgan Wheel Tractor Plant (KZTK) by the order of the Minister of Automotive and Tractor Industry of June 11, 1966), where their many-year serial production was established. Only in the same, 1963 BL. Shaposhnik becomes a member of the CPSU. In the early 1960's, BL. Shaposhnik proceeded to carry out the next task - the creation of a special chassis of high cross-country capacity, designed for the installation of missile launchers. Using the accumulated experience on all-wheel drive tractors, the SKB-1 team in a short time developed the design documentation, significantly increasing the number of new technical solutions that ensure the implementation of the TTT MO. The result is a unique chassis MAZ-543(8x8), which has many advantages over foreign chassis-analogs. Then followed the modifications of this car, extending its capabilities, differing in layout and mounting area (for missile systems of air defense, systems of salvo fire, artillery systems, units for transportation of elements of complexes), including those intended for the national economy. For the creation of the multi-axle chassis of the cross-country ability of the MAZ 543 family, the chief designer of SKB-1 Boris Shaposhnik was awarded the Order of Lenin in 1968 and became a laureate of the State Prize of the USSR. In 1970, on the basis of MAZ-543, a family of Oplot was developed. All cars of this series had engines with a capacity of 650 hp, new reinforced GMFs, reinforced suspension of the front and rear axles, upgraded tires. The next stage of creative work of Shaposhnik was the creation of unified all-wheel drive chassis of increased load-carrying capacity of the wheel formula 12x12 ( MAZ-547 ) and 14x12 ( MAZ-7912 ), which in turn became the basis for the creation of self-propelled launchers for intercontinental strategic missile systems. At the same time, the following main technical problems were solved: increasing the axle load up to 15 tons; application of a larger engine; minimization of own weight with a significant increase in load capacity (the load-carrying capacity increased to 2.1); the introduction of pneumohydraulic suspension and automated GMF, a new frame design, etc. The tests confirmed the correctness of the decisions taken, and the chassis immediately went into series. In 1973, for his services in the creation of high-cross-country vehicles and load-carrying capacity, B.L. Shaposhnik was awarded the title of Hero of Socialist Labor. The whole creative life of BL Shaposhnik, constantly, almost without interruptions, was filled with the solution of complex technical problems for the accelerated creation of new technology. Such non-ordinary, for example, the development of all-wheel drive off-road chassis with the carrying capacity of 150 and 220 tons. At the same time, he managed to work for the future. For example, under his leadership, a unique chassis with an electric drive of wheels on an alternating current MAZ-7907 of the wheel formula 24x24 was created and passed necessary tests . Resolution of the CC CPSU and the USSR on April 21, 1976 "For the creation of a particularly powerful chassis for self-propelled launcher missile complex" Temp-2C "" BL Shaposhnik was awarded the Lenin Prize, which was awarded on June 4 in the Sverdlovsky Hall of the Kremlin. For merits in the creation of special wheeled chassis of the 547th family in 1978, a whole group of Minsk avtozavodtsev - associates of Boris Shaposhnik: I. Demin, B. Chkonia, A. Shimkov, R. Shiroky, S. Parshin, L. became laureates of the USSR State Prize. Golets, S. Kolybelnikov, V. Bysenko, Yu. Lysov. As noted by the famous MAZ director Ivan Demin, Boris Lvovich was an exceptionally talented and talented teacher and educator of young designers. By the mid-1950s, colleagues behind the eyes respectfully called him Grandfather , and not only because for 22-27-year-olds, out of whom basically KB consisted, a person who is under 60 is by definition not young. It was also a huge difference in professional and life experience. According to eyewitnesses, the person he was extremely humane and democratic, for whom "taking action", if one of the subordinates showed unprofessionalism, was torture. And now, decades later, the then young people-the current KB veterans remember with warmth that the Grandfather in an off-duty situation could address them by name, get to know the world's problems. And in the service he did not erase the opinion of subordinates, was extremely polite with them, encouraged studies in science. "Among you is the future chief designer", - he often repeated to his young colleagues. And he himself, until the last moment without naming the surnames, and even more so without creating any hothouse conditions for someone, was preparing a successor. By the way, Lev Borysovich was the designer, and his untimely death was the strongest blow for Boris Shaposhnik. The family along with the case was yet another inflation-free value of his life. Boris Lvovich Shaposhnik, Honored Worker of Science and Technology of the BSSR (1962), Doctor of Technical Sciences (1983), a chevalier of many state awards, retired only when severely ill, in March 1985. And after half a year he was gone - Boris Lvovich died away on September 12, 1985 in Minsk. The main cause of life - the car factory in this city - he gave, therefore, more than 35 years (and in the automotive industry he worked about 55). V.E.Chvylev, first deputy of Shaposhnik, worked with Boris Lvovich for many years. And since 1970, in fact, he was the leading designer for all experimental design work, and since 1977 worked as first deputy Chief Designer. The name of B.L.Shaposhnik forever entered the history of the domestic automotive industry and as a great designer, and as a teacher of a design school, whose students not only preserved the traditions that had developed under it, but also developed them. It was the collective of the MAZ in 1991, shortly before Belarus gained independence, became the basis of the independent Minsk Wheeled Tractor Plant (MZKT) , which had emerged from the Minsk Automobile Plant . In the middle of 2003, the design documentation was developed and 112 names of cars, chassis for equipment and about 35 trailers and semi-trailers were manufactured. All the main transport operations in both mobile and stationary strategic missile systems are carried out by means of vehicles created under the direction of B.L. Shaposhnik. At the suggestion of the leadership of the Central Republican State Archive of Scientific and Technical Documentation, to which the auto planters unanimously joined, the Minsk City Executive Committee installed a memorial plaque in memory of the great engineer. In Pinsk one of the new streets is named after him.